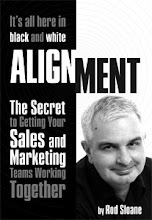 Sales and Marketing Alignment Blog from Rod Sloane: "You're Born an Original. Don't Die a Copy"
That's the title of a best selling book by John Mason. Says it all, have the strength to be yourself not what other think you should be. What are you an original at? That's what you should be spending your time doing, finding out, not copying. When you tell me what it is, please drop me a line. And please, don't copy me!